Phil joined SCCJR in August 2017 as the research associate on the Distant Voices project: a 3-year ESCR and AHRC funded collaborative project between the Scottish Centre for Crime and Justice Research, Vox Liminis, the University of Edinburgh, and the University of West of Scotland. Distant Voices uses collaborative songwriting with people who have experience of the criminal justice system, to explore and challenge ideas about crime, punishment and reintegration. Phil has a PhD in Visual Sociology from Goldsmiths College, University of London entitled ‘In Different Voices: A Practice-based Intervention into the Assemblage of Crime’ (2017). Alongside more traditional approaches, her research methodology includes writing fiction and making films. 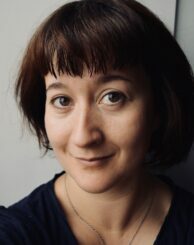 Her key research interests are poststructuralist philosophy particularly the work of Gilles Deleuze, science and technology studies, ethics, collaborative and creative research methods. She has guest lectured on her research at Goldsmiths College (BA Sociology, MA in Postcolonial Studies), and the University of Surrey (MA Performance). Phil previously lectured in Cultural Studies at the London Contemporary Dance School, Trinity Laban, and the Northern School of Contemporary Dance. She has also worked as a graduate tutor in Criminology and Sociology at Goldsmiths College.